Should You Repair Your Furnace or Replace It? Sometimes, problems with your furnace can be solved with little more than a tune-up or some necessary repairs, but eventually, no matter how well you take care of it, you will need to replace your furnace. At East Cooper Heating and Air, our Charleston heating and air conditioning contractors can provide you with any maintenance or repair services you may need for your furnace, and we can also replace it when the time comes. If your Charleston home’s energy costs are rising but you haven’t been using your furnace more often, then your furnace is losing some efficiency. As furnaces age, they become less efficient, which means that they’ll use more energy to produce the same amounts of heat. If your furnace loses too much efficiency, replacing it can be your most economical option. Furnaces break down most often during the last two years of their lives. 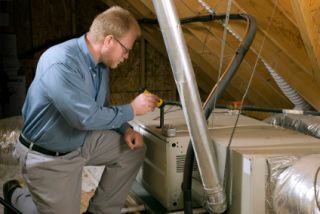 If you need to have your furnace repaired very frequently, it could be that it’s nearing the end of it’s life. Start considering whether or not it’s time to replace your furnace, and talk to our Charleston heating and air contractors about replacement units.